A new section of our website has made its debut and has been launched. 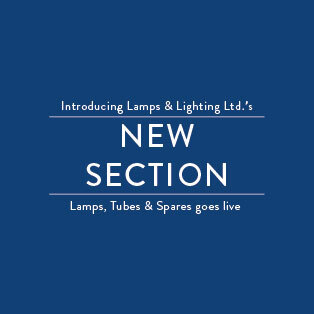 This new section is our spares section, aptly named Lamps, Tubes & Spares. You can find these additional pages via our main product navigation tab; here you can find replacement lamps, LED drivers, high frequency control gear, lenses & glassware. Our commitment to stocking spare components and making them readily available is part of our duty of care to our clients. As with any electrical component, it is accepted that they are not immortal, they have a limited rated product life and a failure rate which the manufacturer deems acceptable. Though we do endeavour to source high quality components from reputable brands in the UK and Europe to ensure our products longevity and reliability, replacements are sometimes required outside of our customers’ warranty. By offering spares we, as a UK manufacturer, hope to never see one of our clients having to replace an entire luminaire for the sake of a single failed component out of warranty or a damaged lens. We acknowledge that our spares section is currently incomplete and we do have plans to make it more comprehensive in the near future with the introduction of additional categories, should you be seeking a replacement and cannot find the component you are looking for please do not hesitate to contact us on 01282 448666. Visit our spares section here. Keep informed of all our news and updates by following us on twitter, @lampslightingUK.